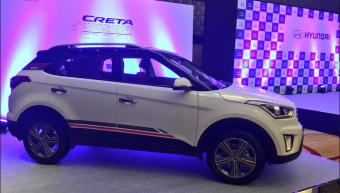 Hyundai is going to introduce the first anniversary edition of Creta next month. This special edition will be based on the SX trim with a 1.6-litre diesel engine producing 128hp and 259.8Nm of torque, coupled to a six-speed manual gearbox. It is expected to be available in three exterior color options – Polar White, Silky Silver and Passion Red, with a black roof which will add more style to its rival. Hyundai has also added some grey and red vinyl stripes on the sides along with the ‘1 Anniversary Edition’ badge across to distinguish it from its predecessor. The 17-inch diamond-cut alloy wheels and chrome door handles from the SX(O) trim also seem to be part of the standard equipment. Changes to the interiors include new dual-tone seat covers, addition of a keyless entry and engine start/stop button from the top variant. The first anniversary edition is likely to be priced over the regular SX trim.